Card Hunter Spring Season, Week 5 + Interviews! Today we get something fun: the stats for week 5 of the Spring PvP Season, and some thoughts from the people at the top of the leaderboards! … but how exactly do you do it? I asked some of the folks at the top of the season rankings to answer a few questions. How do you find time to play so many games? How do you maintain your rating? What’s your preferred strategy? Tell me your go-to team composition and general playstyle. bluebluegreen: Well… my preferred strategy is to win early and often =P. Seriously if I’m losing a game I make a judgement call on whether I’ll be able to reach 2 stars or not and if I don’t believe it’s likely I quit early. I’ll get the time penalty in the queue either way so I try not to keep playing hopeless positions in order to save time and move onto the next game. It’s best to play the most competitive deck you can make because the higher the winning percentage the least amount of games you need to play for the wins. So my fun deck sits on the side lines 90% of the time. In terms of deck design, I’m playing a poor man’s version of Divide and Conquer most of the time and Mass Frenzy + step attacks when I feel the need to change it up. Fyra: Warriors is my favorite, because it’s fast. Either you lose or win in less than 10 minutes, generally speaking. I used to play 3 human warrior girls (Typical Bejeweled Short Sword/Parry warriors) up until a few days ago. I became bored of playing the same over and over again, so I composed a new deck including 2 elf warrior girls and 1 human priest girl. I can already spot a huge difference in both win rate and time it takes to play. This deck is faster, fiercer and most of all, it’s more fun. It also includes as much girlpower! If I get to name my new build it’s going to be called “Barbie Disco.” Why? 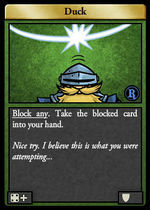 Because, the important cards in the build are Barbed Plate (with Enchanted Harness), Elven Maneuvers and step attacks. 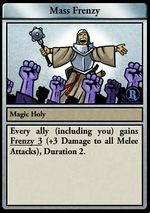 The priest is just a simple Mass Frenzy/Martyr’s Blessing support priest. She has some attacks in there if she has to fight, but she’s mostly in the back being cute and helpful. Tuknir: My preferred team? 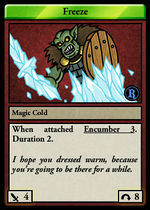 Easy: a variation of dwarven control wizards (3DC) that uses a lot of Path of Knives and Winds of War for the kill. I like to win, but I like to win having fun, and I do love killing enemy characters by “ping-ponging” them to the death. I have 4 “main” decks and sometimes the oddball one, and I change often. I play normal 3DC too, but in the current meta it’s really hard. My go-to team composition at the moment is 2 warriors and a Whirlwind wizard. TheShadowTitan: Since the start of the season I have been using a normal 3DC build with one of the wizards using Sub-zero Staff and the other two Staves of Winter, so I can have different types of encumber and encumber up to 4. The playstyle depends a lot on the hands I get on first round, defensive if I have a bad hand and offensive if I have a really good hand. 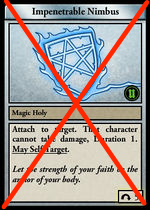 When you are playing 3DC, you should only move your wizards to places that your opponent can reach you if you have blocks or Short Perplexing Ray/Winds of War and you are sure that your wizards won’t die. If you have a good hand, you probably should be aggressive and go for victory points but that also depends on what your opponent is playing. Victory points win a lot of games because 3DC don’t have much damage. Lord Feleran: I’m running 2 warriors and a priest. Maybe I would run some build with wizard(s) but I don’t have enough good items for them at the moment. All 3 of my party are dwarves but I’d still like to test how elves would work with the new cool racials they got. Humans also got some great new racials like Bloody Command and Trainee Command. 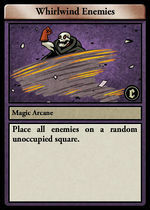 As for strategy, I value card advantage and HP advantage, like we all. I play aggressively and don’t value Impenetrable Nimbus for that reason. 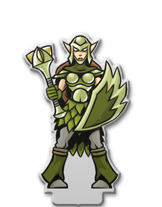 PaladinGP: I take great pleasure in hitting people with large swords, so usually run with two warriors. It’s faster to play and satisfying to get to the top with a no-nonsense style! Generally, I like to maintain tactical flexibility, and the ability to respond to whatever the opponent does. I aim to play the player, not their cards. Two more months—Think you’ll keep it up for the rest of the season? bluebluegreen: There is no way that I’m quitting after after I’ve come this far, halfway through the season! Although I have to say I think next time you ought to shorten the season a bit, it’s a bloody marathon! Fyra: I can’t say either yes or no. It will be a surprise! Tuknir: I will try, but it’s pretty damn hard… Doing 30+ games every day (maybe more if I lose more) is time-consuming, and as I said before I get bored really fast. This good weather don’t help at all! I will try get at least 20 wins a day, but some days I don’t play or just can’t get many, so I need to compensate on another day that I may have more time. My goal is top 10, so will try do enough to get it, but a lot can happen in 2 months, so let’s go one day at a time. TheShadowTitan: I think I can maintain at 1700 rating during the rest of the season but that isn’t enough to stay in the top 3. I think I will stay in the top 10 at least. Lord Feleran: The 4th place is already far behind but I’m currently only one point ahead of TheShadowTitan. Will most likely be a tough competition with him during the next weeks. Paladin on the other hand seems to be clearly out of my reach this season. PaladinGP: Point me to a bookmaker… I hope so! Any advice for players who want to compete with the best? Fyra: Oh my. Well. My best advice is to clear your agenda, that is if you’re going for the most wins category. You also have to keep it cool, it can be very frustrating to have your blocks fail for the 15th time, when you get the 5th Obliterating Bludgeon bashed on your head. 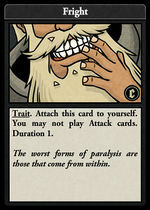 Tuknir: Pick a deck style you like: if you have fun with a deck the better you play. Check the forums; there are some really good decks posted there, which you can change to suit your needs. Also, try not rush too much, go for the kill but have a defense in place if things go badly. Only give up when things are truly lost. Most important: try to adapt to the meta, if your play stagnates you will fall behind. For example, on the Celestial maps, I took Toughness out for Duck, which helped against Whirlwinds. TheShadowTitan: See what the top players are playing and try to counter them. If you can’t beat them, join them xD Have fun, good luck and play a lot! Lord Feleran: Most important one: believe you can do it. Don’t believe those who say you need to pay to win or that you need better items to reach top—you don’t. PaladinGP, TheShadowTitan and I are all playing without a Vibrant Pain. Top 11 can be reached with almost anyone’s collection. If you find yourself losing to some builds too often, think what you can change to avoid that. Don’t be afraid to try something new—lost rating can be won back and gained experience will make that happen. PaladinGP: Deckbuilding is crucial. Try to avoid ‘dead’ draws. Some of my favourite items have consistent silver draws, rather than a few great ones and some weak ones. 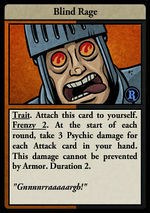 This is well illustrated if you’ve ever had a bad experience with Fright: Often, one particular turn is crucial, and you really don’t want to draw a blank the turn your opponent comes at you with everything they’ve got. Try to analyse what went wrong when you lose a game: if you can take a learning point from every defeat, you’ll get better fast. Sometimes it’s pure luck, but not as often as it may feel that way. Deckbuilding weaknesses can be hard to see, so making a guild with friends to discuss deck ideas can be rewarding. And most of all, enjoy this superbly designed game! Whew! They all had some pretty cool things to say. Big thanks to these players for taking the time out of their busy card-hunting schedules to respond. I hope their advice proves helpful to all Card Hunters, whether you are trying to compete in this season or just improve your ranked game.